Reckweg 102 Men Care Pack contains Dr. Reckeweg R41 Sexual Neurasthenia Drop and Dr. Reckeweg Agnus Castus Dilution 30CH. 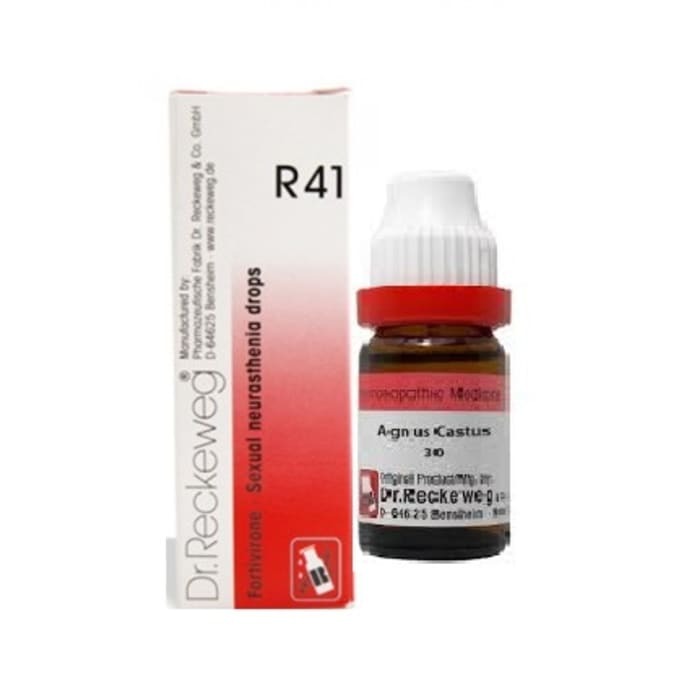 Reckeweg-R41 Sexual Weakness Drop is a homeopathic medicine for men. It contains Acidum phosphoricum, Agnus castus, China, Conium, Damiana, Sepia, Testes. It is used as a tonic in case of impotence and lack of libido, lack of vitality, weakness with high efficacy in low dilution. A specific effect in cases of disturbances after debilitating illnesses. Also used in angry irritations, lack of concentration, hypochondria and in senile debility. It strengthens the genital regions. It acts in cases of exhaustion of all cellular functions, fatigue, aversion, repugnance for coition. Acts as substitute and stimulant in the organotherapeutic sense. Uses in lack of vitality asthenia, spermatorrhoea and in general debility especially in men. Generally 2-3 times daily 15 drops in a little water before meals. In cases of long standing and to achieve a more rapid result, for 2-3 days 10-15 drops can be taken every 1-2 hours. This remedy is prepared from a plant, which is commonly known as the Chaste tree. It is used for impotence, depression, sexual weakness, and forgetfulness. Directions for use: As prescribed by the physician. A licensed pharmacy from your nearest location will deliver Dr. Reckeweg Men Care Combo (R41 + Agnus Castus Dilution 30CH). Once the pharmacy accepts your order, the details of the pharmacy will be shared with you. Acceptance of your order is based on the validity of your prescription and the availability of this medicine.